I made this for a much-loved cousin who is struggling with serious ill-health and hospitalisation. I thought the soothing colours and church window design would be uplifting for his spirits. 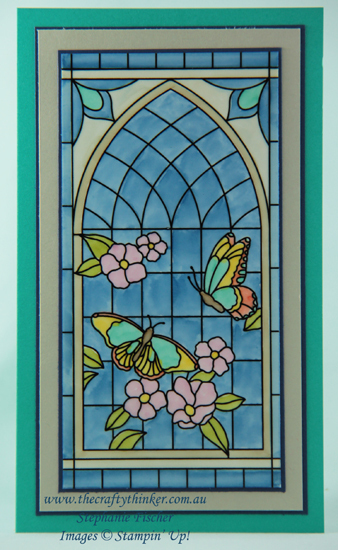 I coloured the piece of Graceful Glass Designer Vellum with a variety of Stampin' Blends alcohol markers - choosing to colour the front of the vellum for stronger, brighter colours. Having adhered the vellum to a piece of Whisper White cardstock, I added it to the front of the card. The card layers are Bermuda Bay, Night of Navy and Sahara Sand.